Hundreds of millions of dollars have been spent building public park space in far west Chelsea, whose primary purpose is to be economic engines for the future growth of NYC, rather then creating parks that meet the needs of most Chelsea’s seniors. The High Line provides an enjoyable walk and beautiful views — but as a park, it is so far away from most of Chelsea’s seniors that it is of only marginal usefulness for them. 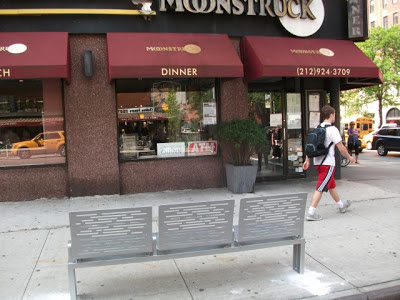 Chelsea's Citybench in front of the Moonstruck Diner. $2,000 worth of not truly great views, but a truly great place for the senior, in the photo below, to sit while walking in Chelsea. 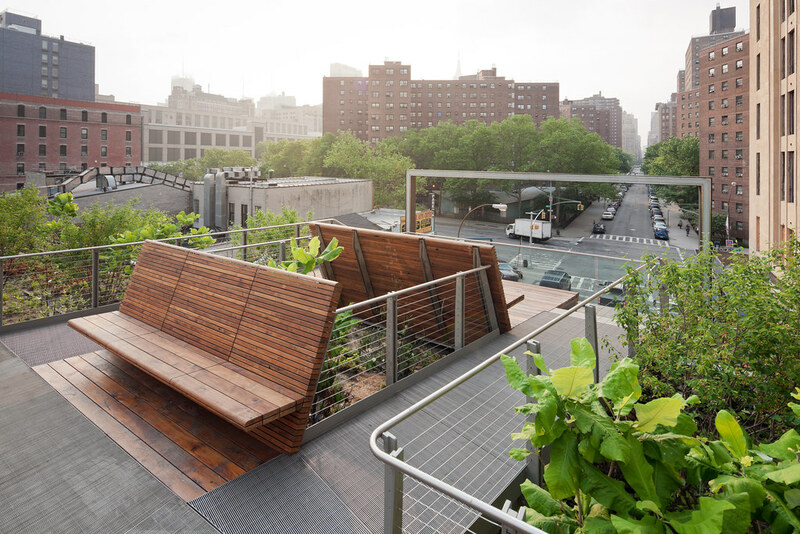 Here are some thoughts on creating outdoor spaces that meet the real needs of Chelsea’s seniors. NYC Plan 2030 promises a park with 10 minutes of every New Yorker by 2030. 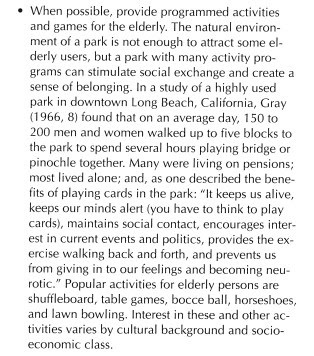 The trouble with this plan is that many of today’s seniors will be gone by 2030 — and even if there is a park with a 10-minute walk, studies have shown that park usage drops drastically when parks are more than a three- minute walk away (read Christopher Alexander’s “A Pattern Language” for more info). The good news is that most of Chelsea now has (or will shortly have) a public place to sit with a three-minute walk. 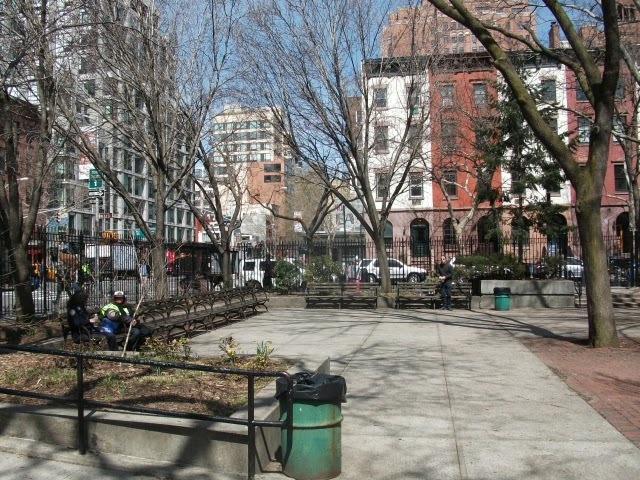 See the Park Chelsea News for more information. 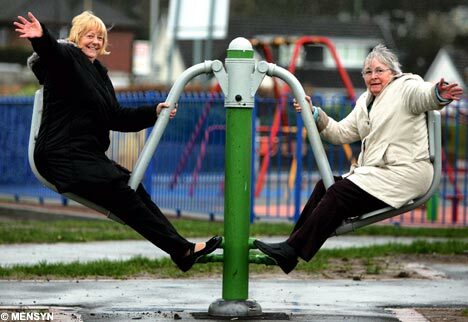 We still need more actual parks that are really close to where seniors live, though — and sooner than 2030! Chelsea has some great supermarkets in Trader Joe’s, Fairway and Western Beef. But for many seniors, traveling to these supermarkets on sidewalks without any place to sit makes the task of shopping much harder. It would be great if Chelsea had public seating on each block of every Avenue and side street, so that seniors could sit on their way to and from shopping. 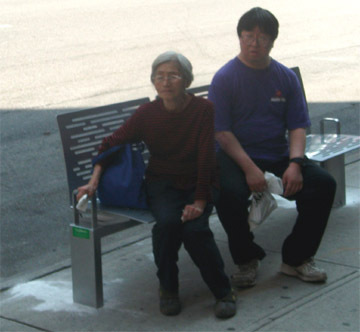 We don’t have this yet, but what we do have is several “Shopping Trails” — stretches of sidewalks with CityBenches that gives our seniors places to sit while shopping. To request that a bench be installed at a specific location, visit nyc.gov/citybench. 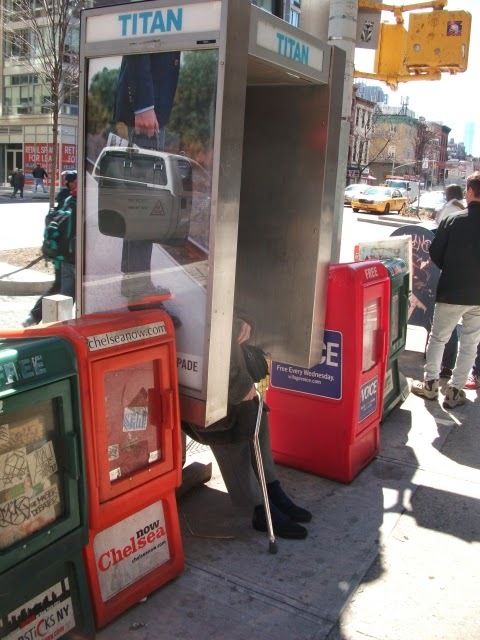 The Chelsea resident in this photo needed a place to sit on her way home.Most of Chelsea's streets offer no seating, her only option was yo lean on this telephone booth. Benches are great for solitary sitting and resting while shopping, but they are lousy to have a conversation on. Moveable tables and chairs (like those currently available near the Flatiron building) are much better for this. Chelsea’s seniors need more locations with similar arrangements — where two, three, four people can gather and look at one another while they talk! Fixed bench seating at around edges of space at Chelsea's Clark Clement Moore Park. No social seating is available at this park. The sitting portion of this park has a great deal of empty space, which is of no use to users of the park. Here's another Moore Park, Moore Homestead Park in Elhurst Queens. It offers social seating in the form of fixed tables and chairs that are far more accommodating to the conversation and recreation needs of these seniors.This type of seating is not reconfigurable. 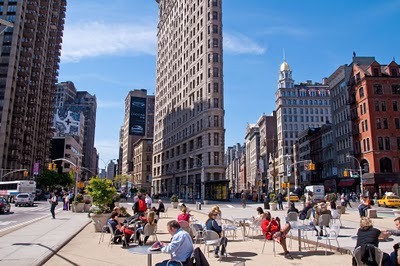 The best type of social seating is the moveable tables and chairs that can be found at Flatiron Plaza,. This is "have it your way seating" that enhances conversations and other recreational activities. This seating can also be easily moved when a community function requires a open space. A place to sit outdoors is the minimum Chelsea seniors need. Currently, with the exception of people-watching, there are few meaningful activities for seniors at most of our outdoor seating locations. We need to offer more activities. This will serve a real need for those who have little, or no, disposable income to spend on indoor activities that charge admission. 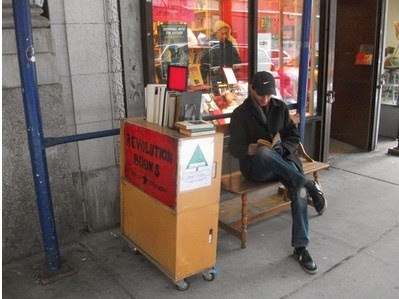 Revolution Books on 26th St offers an outdoor reading room, where Chelsea seniors can rest and read or purchase a book. 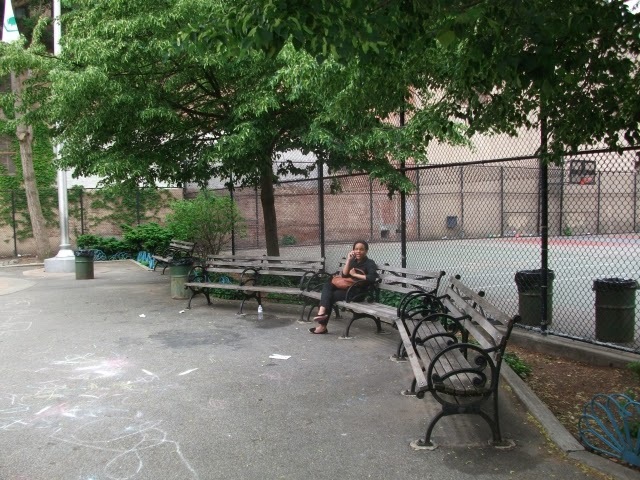 A 2012 Park Chelsea News blog entry ran an inspiring article by Kathy Antoniotti. Originally printed in the November 4, 2011 edition of the Beacon Journal, Antoniotti’s coverage of a newly opened Springfield Township, Ohio facility noted that its “eight pieces of low-impact athletic equipment designed especially for older adults is believed to be only the second of its kind in the country.” Chelsea’s public parks are totally lacking in outdoor recreation for seniors, and the addition of a few “Senior Playgrounds” seems like a great idea. Two of Chelsea's senior centers have adjacent outdoor spaces that offer seniors no more then a place to sit outdoors. These outdoor spaces are sparsely used by seniors. 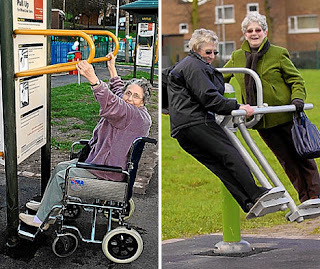 Adding senior exercise equipment to these spaces can transform them into seniors playgrounds. Beyond being simply a place to sit down for everyone, Chelsea’s lack of seating is actually creating a dangerous situation. Our senior citizens must wait on our street corners, with no seating, to be picked up by Access-A-Ride. My mother, for instance, having just had open heart surgery, once waited for an Access-A-Ride pickup, standing on a street corner for over an hour — and the AAR pickup never showed. Union Health Center has a medical facility on Seventh Avenue, between 25th and 26th Streets. After examination, I found people waiting for a pickup of Access-A-Ride. They too were waiting up to an hour or more and had no place to sit. 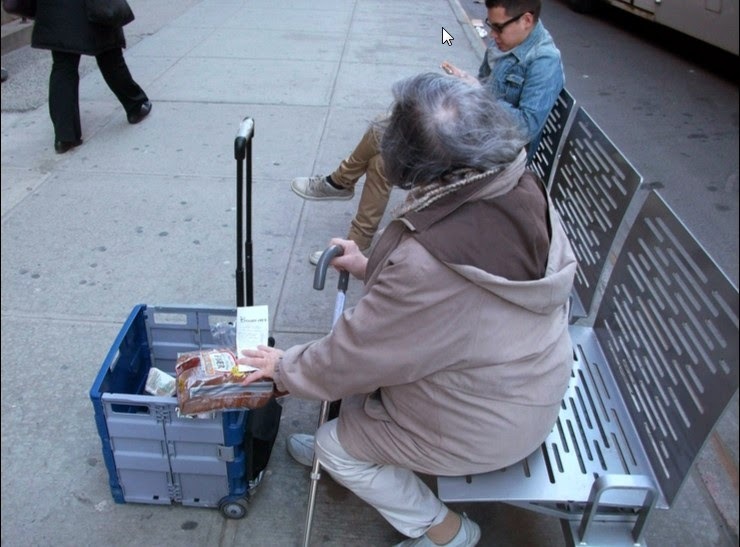 This woman in this photo is at an Access a Ride stop near Penn Station . She had been waiting over an hour for a pickup that had not showed. 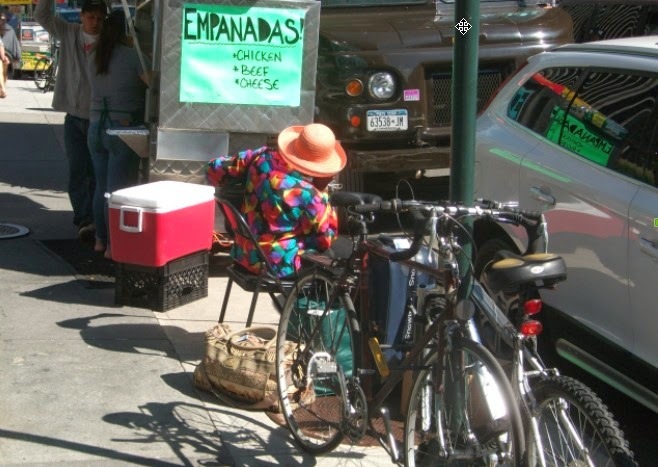 She was lucky that the vendor next to the stop allowed her to use his chair while waiting. 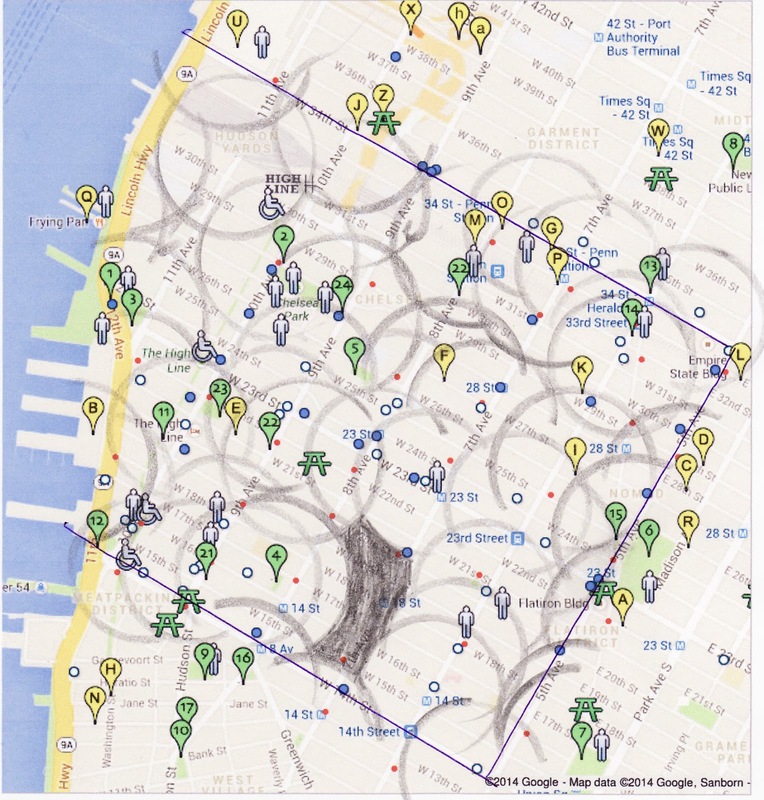 – For a printable Park Chelsea map, go to Parks311.com. Y ARNOLD BOB | Hundreds of millions of dollars have been spent building public park space in far west Chelsea, whose primary purpose is to be economic engines for the future growth of NYC, rather then creating parks that meet the needs of most Chelsea’s seniors. The High Line provides an enjoyable walk and beautiful views — but as a park, it is so far away from most of Chelsea’s seniors that it is of only marginal usefulness for them. NYC Plan 2030 promises a park with 10 minutes of every New Yorker by 2030. 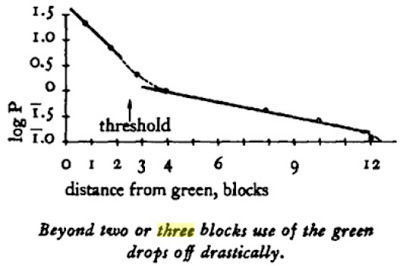 The trouble with this plan is that many of today’s seniors will be gone by 2030 — and even if there is a park with a 10-minute walk, studies have shown that park usage drops drastically when parks are more than a three- minute walk away (read Christopher Alexander’s “A Pattern Language” for more info). The good news is that most of Chelsea now has (or will shortly have) a public place to sit with a three-minute walk. See the Park Chelsea News for more information (parkchelseanews.blogspot.com). We still need more actual parks that are really close to where seniors live, though — and sooner than 2030! How often do people visit parks?